Nestled in Utah’s scenic southwest region, Kanab is a desert flower of color and culture, where vibrant arts and delicious cuisine blend with a backdrop of multi-hued cliffs and canyons. The town was planted with cowboy grit, but has blossomed under Hollywood lights and a flow of travelers. A long-time classic of the American West, Kanab was once the setting for Western films, but is now an international crossroads for visitors to national and state parks, monuments, and recreation areas. Spirit of adventure and diversity of culture has inspired a wealth of cuisine in Kanab, but true to its cowboy roots, you will find homegrown tradition and small-town friendly service with every meal. You won’t find much fast food or many chains, but rather restaurants that are uniquely Utah, run by local families who welcome faces and flavors from all over. Houston’s Trail’s End Restaurant : The Trail’s End Restaurant has been a Kanab staple since 1945, and for the past 40 years the Houston family has kept the Old West legacy alive by serving up homestyle country cooking in their saloon-style diner with cowboy decor. Come on in to enjoy sandwiches, wraps, soups, or salad for lunch, and burgers, steak, ribs, chicken or shrimp for dinner. DayLean’s fresh-baked rolls with Grandpa Bob’s country gravy are a local favorite, served warm on the side or a la carte. Peekaboo Wood-Fired Kitchen : Named for the stunning slot canyon that attracts people from all over the world to southern Utah, Peekaboo does the same with their vegetarian-only menu, blending international flair with local fare. Pizzas are the trademark here, always made to order in their wood-fired oven. Toppings range from classic to creative, and gluten free crust is an option. There are also burgers and sandwiches, salads, rotating specials, and a full brunch menu to boot. Shady patio seating set back from the street is enough reason to wander into Peekaboo, and the variety of tastes is reason to come back. Big Al’s Burgers : Before hitting the road out of Kanab, don’t forget to fill up–your belly, that is. Big Al’s retro-style diner makes the perfect pit stop. Try the Big Red burger which is sure to satisfy with ham and bacon plus a patty. Add on a family order of fries and a side of their special-made fry sauce to keep the whole car happy, and finish it off with a old-fashioned milkshake in your choice of flavor. Casual French/Italian bistro serving traditional comfort food and pastas with house-made desserts. Casual bistro serving slow-cooked, home-style French and Italian dishes as well as fresh seafood and steaks. Our classically trained French chefs prepare traditional dishes as well as creative new ones. Sego Restaurant : Consistently rated as one of the region’s top restaurants, Sego never fails to impress. Even big-city foodies will be pleasantly surprised by Sego’s refined dining concept that highlights local specialties while blending far-flung flavors. It’s all about sharing favorites and providing an overall social experience, which is furthered by the tapas-style menu. Portions are designed to be passed around the table for a little taste of everything. Be sure to ask about locally sourced specials and the fish of the day. 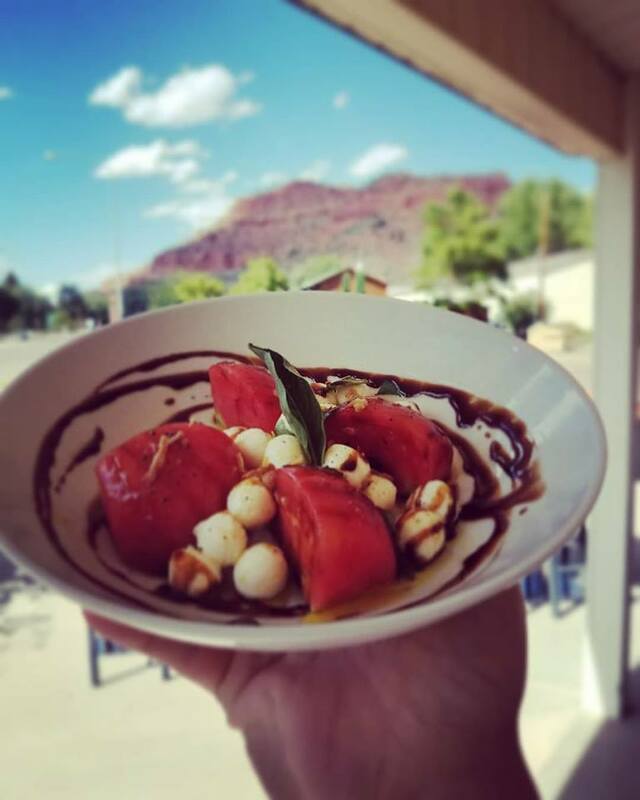 Wild Thyme Cafe : A newer arrival to Kanab’s dining scene, Wild Thyme is quickly becoming a popular choice for gourmet dishes in a casual setting. Their carefully curated selection has just the right variety of craft recipes and includes vegetarian and vegan options. Crowning the menu is filet mignon, which is a strong contender for best steak in Kanab. Other delectables include dry-rubbed ribs, salmon filet, fish tostada, vegetarian baked penne, vegan tostada, vegan gumbo, and rich desserts. Don’t miss a chance at a side of their country cornbread with sweet agave butter. Juniper Ridge:Whether for those nights when you just need to get out and relax after a long day of work, or to finish off an amazing day of adventure in one of our surrounding National Parks, On the Ridge is your go to social location in the Kanab area! With eight on tap micro brews and professional bar tenders, whatever it is you’re drinking, we’ve got it! Pizza, wings, and pub classics are served all night, homemade and delicious. The perfect things to make every game night feel like the Super Bowl. Iron Horse Grill:The Iron Horse Restaurant and Saloon features the only full-service bar in Kanab, Utah. Which is why it is a popular destination for a certain segment of the population and visiting tourist trade. But it’s much more than a saloon. Located at 78 East Center Street, behind Denny’s Wigwam, within earshot of Parry Lodge, it is open seven days a week from 11:30 to 10 with live music at 7 from Tuesday through Saturday. The steaks from the grill are very tempting–the 36-ounce John Wayne bone-in beef ribeye, the eight-ounce Maureen O’Hara beef flat iron steak and the 14-ounce Frank Sinatra New York strip–but we had other menu items in mind. For starters, we shared a Sonoran chicken salad with grilled chicken topped with tomatoes, beans, onions, corn, shredded cheese and BBQ Ranch dressing. Also some chicken wings and BBQ chili cheese fries. For an entree, my wife stuck to an old favorite, grilled North Atlantic salmon, with baked potato. 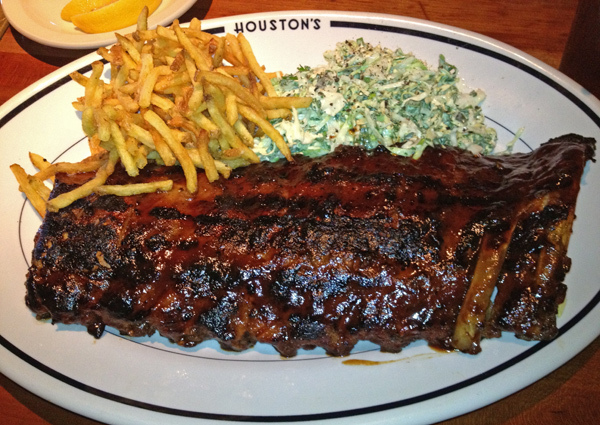 I had a feeling for St. Louis style pork ribs, dry rubbed and smoked with mesquite wood in house, with cornbread, cole slaw and fries. Dessert was a tough choice. Apple cobbler or peach cobbler or banana cream pie or strawberry shortcake or wildberry sorbet? We finally decided to share slices of apple cobbler and peach cobbler with scoops of vanilla ice cream. Who cares about calories when you’re on vacation? Rocking V Cafe:The key to all great cooking is fire. Knowing what to set on fire and for how long is the mystery. Fortunately for you (and us), our chefs have figured it all out. It’s slow food. Real food. Carefully prepared by real human hands, served by happy people, also with real human hands, in a warm and inviting space. Simple. We use the freshest ingredients available to prepare dishes that are a little different from the food you get at other places along the road. Plenty of pasta, fish, chicken, beef & lots of greens. Spring mix, romaine, carrots, cukes, broccoli, red onions, yellow squash, roma tomatoes, mushrooms. No iceberg. Vegan? No prob. We can do that & any salad without cheese or meat. All our soups are made in house from scratch. Scratch is a valuable ingredient in slow food. Most of our fish comes whole & on ice. We cut it ourselves. We try to get as much local produce as we can & we buy many of our herbs locally. The cream for each dessert is whipped by hand & the mint & pansies come from our garden (or random neighborhood gardens, if we run out). Our food may take a little longer to prepare, but it’s real food. Savor the taste. It’s good food. Simple. Kanab Creek Bakery : A local favorite, Kanab Creek specializes in artisan breads and other baked goodies. You can of course grab a morning coffee and treat and be on your way, but you’d be missing out on what else they have to offer: a meal made fresh to order. The restaurant is open for breakfast and lunch and features hometown staples as well as exotic delights–breakfast burritos, shakshuka, quiche, country breakfast, waffles, paella, asada steak, hot sandwiches, salads, sorbet, gelato, and the list goes on. Enjoy inside or on the patio. Willow Canyon Outdoor : To fuel up for your day and gear up for your adventure all in the same place, stop into Willow Canyon Outdoor. This outfitter store also has a coffee and espresso bar staffed by fellow adventurers who are happy to share info on nearby destinations. Moon Saloon : This Wild West-looking storefront is right at home in Kanab, and conveniently set next to the movie theater making it a popular grab-n-go at all times of day. They pack way more than just coffee into their little canteen, however. Grab more provisions like snacks, cold drinks, smoothies, hot dogs, and vegetarian items before you hit the ol’ dusty trail.